You'll need to scroll down a little til you see the card. ha ha...I'm just finally getting a chance to check out our new groups' blogs and this is what I see? LOL Glad you found something to inspire you on my blog...I like the changes. 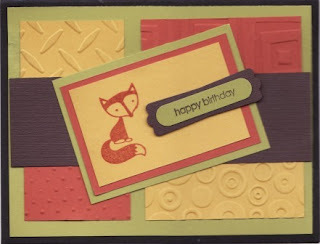 I love how you used the fox from this set. I also love the CB folders you used... My fav is the one that looks like it is a metal criss cross (like a garage floor or something). I will be stopping in regularly from now on. glad to have found you.